At Electric Jive we love South African music. 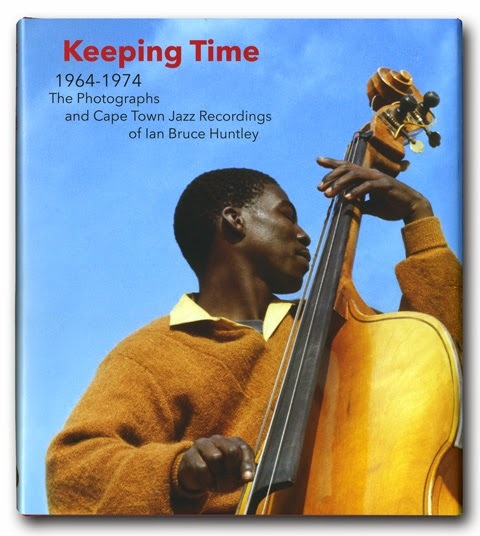 and since July 2009 we have slowly built up one of the more comprehensive references and archives of out of print (and unpublished) music produced in the country. But we also love our sojourns to styles and music from beyond the borders. One of the enduring styles that can be reliable turned to to bring a smile is that produced from Congolese bands that landed up in East Africa - based in Uganda, Tanzania or Kenya when work opportunities in the Zaire were scarce. Like Abijan, Dar es Salam and Nairobi became hubs for bands willing to take up residency at hotels where one of their primary functions was to ensure high beer consumption. Often bands would play all night, or at the very least until the early hours of the mornings with multiple sets. 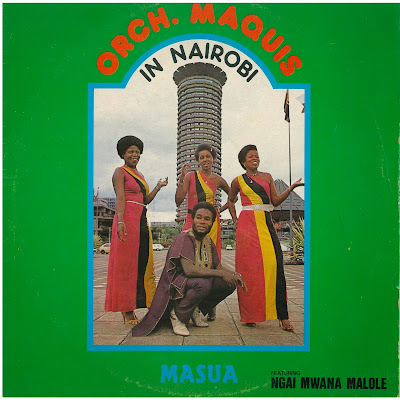 Today's post celebrates Orchestre Maquis and their 1982 album Masua. Originally known as Orchestre Super Gabby, Orchestre Ma Quis Du Zaire was formed in 1963 in a town called Kamina in Zaire's Shaba province. The founding members of the group are: Tshinyama Katay, Tshimbuiza Tshinsense (Nhuza Viking), Mbuya Makonga (Adios), Tshibangu Katay, Ilunga Lubaba, Mutombo Lufungula. Mwema Mudjanga and Mwema wa Mwamba. Together they approached a businessman who ran a bar and restaurant and also owned musical instruments and after discussions it was agreed that they perform at the bar. During the following six years of hard work they acquired enough money to purchase their own musical instruments. 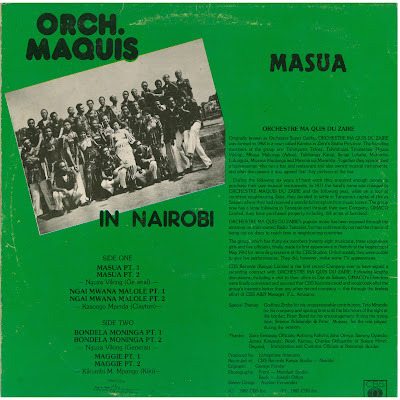 In 1971 the band's name was changed to Orchestre Maquis du Zaire and the following year, while on a tour of countries neighbouring Zaire, they decided to settle in Tanzania's capital of Dar es Salaam where they received a wonderful reception from musical lovers. The group now has a large following in Tanzania and through their company OMACO Limited they have purchased property including 154 acres of farmland. 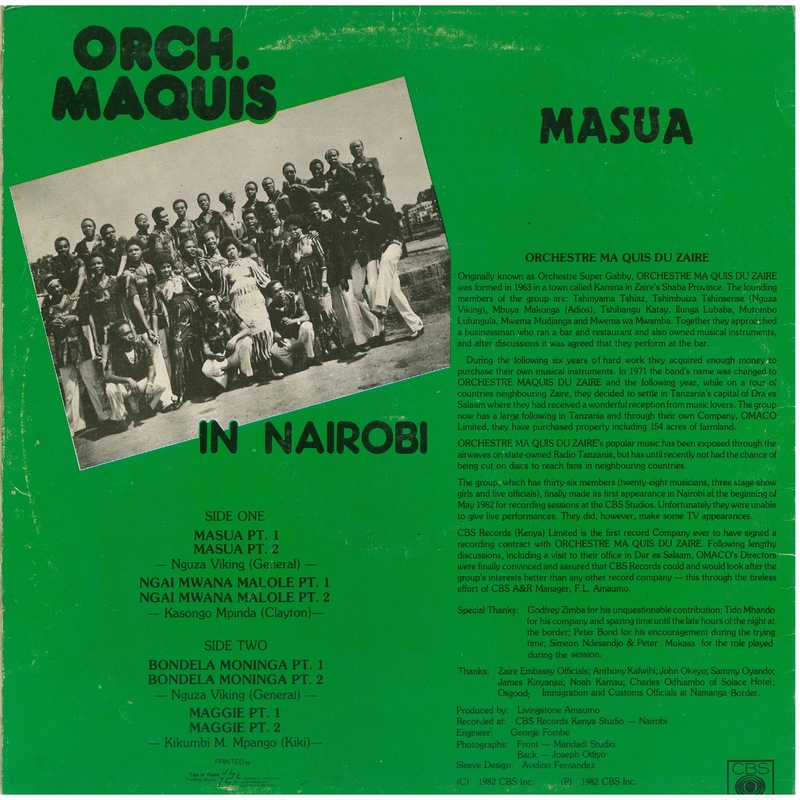 Orchestre Ma Quis Du Zaires's popular music has been exposed through the airwaves on state-owned Radio Tanzania, but until recently not had the chance of being cut on discs to reach fans in neighbouring countries. The group, which has thirty -six members (twenty eight musicians, thress stage show girls and five officials) finally made its first appearance in Nairobi at the beinging of May 1982 for recording sessions at the CBS studio Unfortunately they were unable to give live persfomances. They did however make some TV appearances. CBS Records Kenyan Limited is the first record company ever to have signed a recording contract with Orchestre Marquis du Ziare. Following lengthy discussions, including a visit to their office in Dar es Salaam, OMACO's directors were finally convinced and assured CBS records could and would look after the group's interests better than any other record company - this through the tireless effort of CBS A&R manager FL Amaumo. Godfrey ZImba for his unquestionable contribution, Tido Mhando for his company and sparing time until the late hours of the night at the border; Peter Bond for his encouragement during the trying time; Simon Ndesandjo and Peter Musaka for the role played during the session. (c) 1982 CBS Inc, (p) 1982 CBS Inc.
Hmmm, Here I found the perfect match of Theme and content, but the issue is that, the siteis loading very slow on my browser. Does anybody also facing the same issue or I am the single one here???? By the way nice to be a part of discussion!!! I regret to be unable to download this post, date of file expired.